Sorry if this doesn't work, I'm new. Here is some pics of my weekend mod. Tell me what you guys think. Nice looking rims, So did you do it yourself and how many hours did it take? That looks real good. How did youdo that? Yeah I did it myself. It took me the whole weekend to do b/c I had some crappy stripper. After I got some good stuff (TAL-STRIP II AIRCRAFT COATING REMOVER) It took me only enough time to spray it on wipe it off and then polish. So with the good stuff maybe an hour per wheel. Ok so how do you do it ? what do you need and how do you use it ??? Looks nice. I've had chrome polish rims on my car for 6yrs and let me tell you...they look nice at night n stuff but after a while, your gonna wish u never did it for the simple fact that they get dirty fast. When it comes to chrome, aluminum polish wheels, they are hard to keep clean. Get ready to clean those rims everyday. Your work looks tight , give u props. 1. Tape up every part of the rim and anything else that you do not want the paint removed off of. 4. Use either your rag or the steel wool (the finnest you can get) with some paint thinner on it to remove the loose paint. The nylon brush just helps to get the paint from right next to the tire. 5. After you remove all of the loose paint and stripper clean it up and Polish. 6. Then you have the finished product. Thanks for the info I am going to give it a go as soon as I get a stand or stands for the bike. I just cant belive how much your wheels look like chrome. They truly look alsome is their any trick to takeing the wheels off? I didn't take the wheels of my bike and I don't have stands. It's still easy to do w/o stands or taking the wheels off. It just takes a little more floor sitting and neck breaking. Be prepared the catch the cramps of a lifetime in your hands and forearms. I cant wait. So I guess your did not ride for a day or two then. great job.... definitely something I'm considering doing during the offseason. Yeah I didn't ride this whole weekend just b/c I had the tape on the rims. If I didn't have the tape I would have been riding some half done rims. It killed me not to be able to ride. how well does the polished parts of the wheels hold up as opposed to having the black finish? 08' ZX10R - LOTS OF GOODIES!!! Nice job, thanks for posting pics. nice job, the rims look good. To tell you the truth I have only been on one ride since it has been done. I got a few water spots on them during the ride and they come right of with a little TLC. I am going to keep mine black just because I don't really care for alot of shine on a sportbike, I'm not much into the whole polishing your frame and swingarm and buying all the chrome do dads. I've got the tribal so I am going the other way and am trying to black everything out. your rims turned out good though bro, good job. I see your using the mothers polish but what I would really recommend that is many times better than the mothers is a polish called "Never Dull", you can find it at like discount tire or many auto parts stores. I used that on my show truck and the wheels always looked great and water spots were never a problem because the water never stayed on the wheel because it just beaded right off. I highly recommend the "Never Dull" polish. Those look great, but I'll stick to black. Don't need something else to clean every time I ride. 04' 600rr function over fashion at this point. looks good, I polished mine 2 weeks ago and I'm still getting + comments. I did the same thing. started out with crappy stripper then a bud hooked me up with airplane paint remover, it's the bomb. and far as cleaning if you have front and rear stands it only takes a few extra minutes to shine them up when you clean your bike. Looks good, now go get them cleared over so it's easier to keep clean. So let me get this staight, You guys did not use any form of sand paper when polishing your wheels? Everyone that i have seen done you have to go through the steps of the different grades of paper to get the shine. I'm in if this all you have to do. I have put it off b/c I was told you had to sand it down. 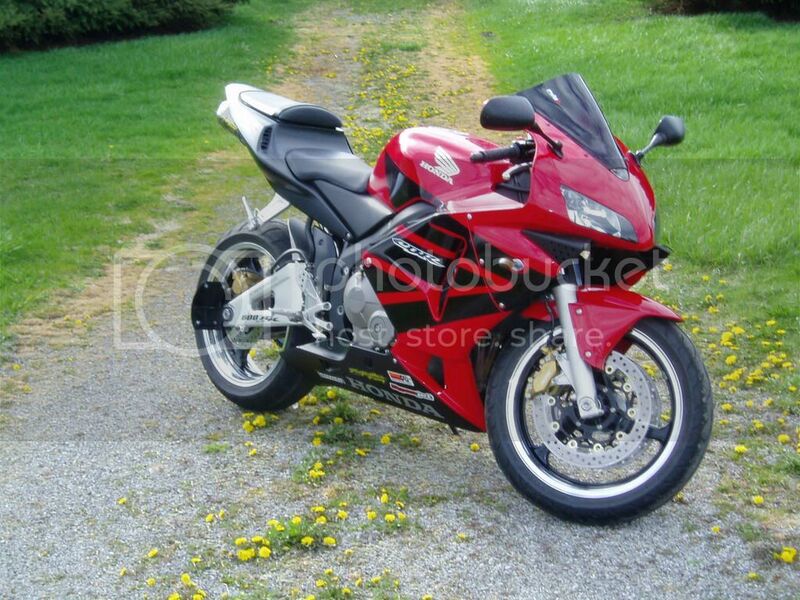 2005 HONDA CBR 600RR SILVER/BLACK. after the stripper has done it's business I just used an SOS pad or Brilo pad to wash the lip. a little preasure and they shine right up. not hard at all. mine shine as much as the one's in the pic's above and I haven't even put the mothers to mine yet.